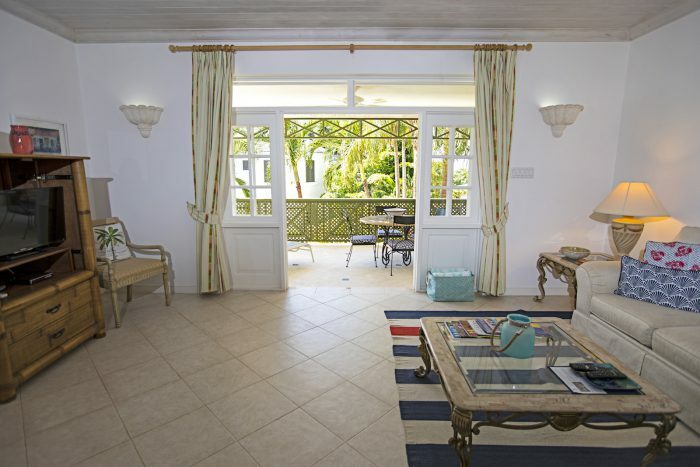 Little Seascape is a cosy one bedroom fully air-conditioned apartment with a large open patio located at Gibbs Bay in St Peter, 5 minutes into Speightstown or 15 minutes into Holetown. You enter Little Seascape via the large wooden deck with a table for outdoor dining and lounge chairs for relaxing under the mahogany trees. The open plan interior features a well equipped kitchen and a small dining and sitting area. The bedroom is separated via an accordion room divider, and there is an ensuite bathroom. The large deck is perfect for relaxing or enjoying a barbeque dinner under the moon and stars. A private path leads directly on to the beautiful Gibbs Beach, with the calm, turquoise blue Caribbean sea inviting you in! . Little Seascape is the perfect romantic hideaway and for those seeking a quiet and reserved stay. Housekeeping service is provided 2 days a week. A cook can be arranged at an additional charge. Little Seascape is located off the main street so you may hear road noise but this will be minimal since the apartment is fully air-conditioned. Beacon Hill is a private and gated condo complex opposite the popular Mullins Beach and this beautifully furnished second floor apartment features a balcony for dining and relaxing plus access to the roof top deck with swimming pool, sun beds and and gorgeous sea views. Reeds House is a boutique condo complex on Reeds Bay, on the west coast. This one bedroom penthouse unit boasts a private roof top deck with a spa pool, sun beds, BBQ, wet bar and amazing sea and sunset views. Holetown and Speightstown are close by. This is an ideal location for a romantic, tropical getaway or honeymoon.